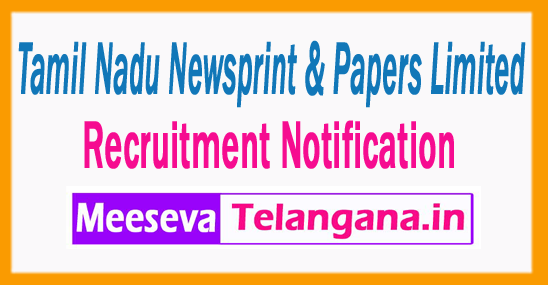 Tamil Nadu Newsprint & Papers Limited (TNPL) Has Invited Application Form For 03 General Manager. All Eligible Candidates Are Required To check Eligibility details for TNPLApply Offline Before 6th July 2017 All Candidates Who Are Applying For TNPL Recruitment 2017 - 03 General Manager, Should Check Vacancy Details Like - Educational Qualifications And Experiences Requirement, Exam Pattern, Syllabus, Age Limit, Selection Criteria, Admit Card, Results, Exam Date, Before Applying. General Manager (Corporate Technical Cell), Tamil Nadu Newsprint & Papers Limited, No-67, Mount Road Guindy, Chennai-600032 Tamil Nadu.